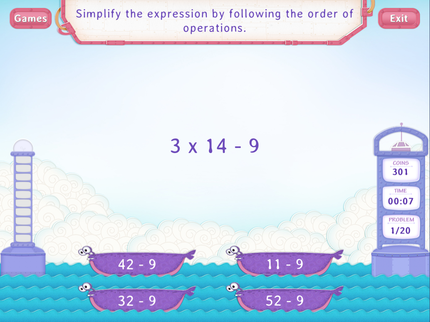 What is order of operations? In math, order of operations are the rules that state the sequence in which the multiple operations in an expression should be solved. 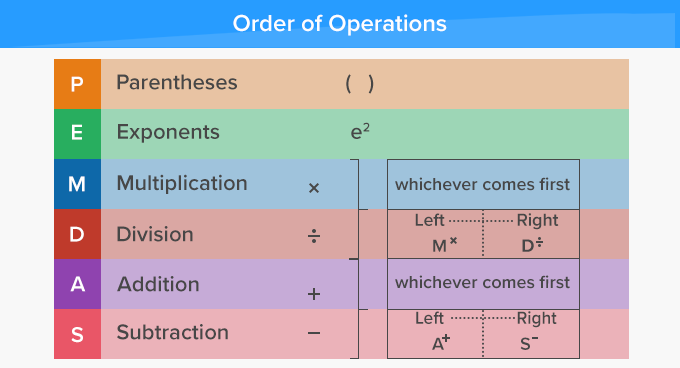 A way to remember the order of the operations is PEMDAS, where in each letter stands for a mathematical operation. 2. Exponents - Work out all the exponential expressions. 3. Multiplication and Division - Next, moving from left to right, multiply and/or divide whichever comes first. 4. Addition and Subtraction - Lastly, moving from left to right, add and/or subtract whichever comes first. Why follow order of operations? The rules of the order of operations are followed while solving expressions, so that everyone arrives at the same answer. Here’s an instance how we can get different answers if order of operations is NOT followed. A popular mnemonic used to remember the order of operations -PEMDAS is ‘Please Excuse My Dear Aunt Sally’. Solve in order, else there'll be tensions. Start by opening the Parentheses. Jump up with the Exponents. Cube or Square - it's all very fair! Next, Multiply or Divide - jus' go left to right. Add or Subtract come last but they’re easy. finally, it's as simple as A B C D! Instead of handing out practice worksheets to your child, form word problems from real life situations. 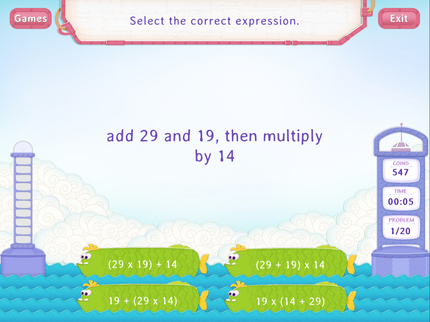 This will help them to form expressions and use order of operations to solve them. For instance, take your child out for shopping. Ask them to pick out 2 dozen eggs, 3 packets of hot dog buns, 2 packets of candy and 2 boxes of cereal. Then, ask them to put one box of cereal back. Now, ask your child the number of eggs in a dozen, number of buns in a packet, number of candies in a packet and calculate the total number of items bought. Ask them to form an expression and use order of operations to find the answer.